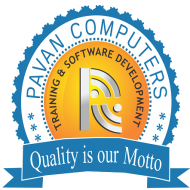 Pavan Computers provides computer Education, Training and Software Development. We have been training students since 2000. Training is provided by experienced faculties with industry experience. Our mission is to provide unique Computer Literacy to each and every person. Our goal is giving good training in both Technical and Communication Skills. We provide in-depth subject knowledge, Career Guidance and motivate our students to achieve their goals with professional excellence. We display commitment, dedication, discipline and innovation, and we want to see the same in every student. Our success is make student in writing code by his/her own. We provide Home Based, Class Room and Online Training. "I have taken Python course at Pavan computers I feel it's a good institute. I have improved my programming skills. Classes are being well understood and each concept is explained with examples. Mr. Murthy (head of institutions, tutor) who already worked in the software industry has a good experience, and is knowledgeable person. I am going to do a real time project under his guidance. I feel it's not a commercial oriented institute. I suggest Pavan computers for the courses specified by the Institute. " "The course I have undertaken was very useful. Classes will taken in a very friendly manner, everybody is free to express any kind of doubts. Mr. Murthy (head of institution, tutor) is an experienced candidate from software industry, so he can guide us with real time projects and problems being faced in real time. He does his teacher concept by concept by giving enough number of examples, and is ready to explain n number of times until we understand. Here by i suggest, to prefer Pavan Computers for any courses specified by Institute. " Pavan Computers conducts classes in .Net Training, C Language and C++ Language. It is located in Boduppal, Hyderabad. It takes Regular Classes- at the Institute and Online Classes- via online medium. It has got 2 reviews till now with 100% positive feedback.